Start feeling your best by entering the Old London Foods Skinny Jeans Attitude challenge. Submit a photo of you in your skinny jeans and an essay about how committing to a healthier lifestyle has helped you find that skinny jeans attitude at OldLondonFoods.com. Hint – it’s not about being a size 0, it’s about finding your inner confidence. One lucky winner will receive an all-expenses paid trip for two to Los Angeles to attend the premier episode of the hit TV show Dancing With the Stars, and a haircut at one of LA’s hottest salons. The contest runs until the end of May and consumers can log on July 20th to vote for their favorite entries. It’s National Eating Disorders Association Awareness Week! NEDA is helping both women and men promote a healthy body image through seminars, workshops, and fashion shows featuring models of all healthy shapes and sizes. They’re also having the Great Jeans Giveaway, which encourages people to get rid of jeans that don’t fit and to buy jeans that respect one’s genes. 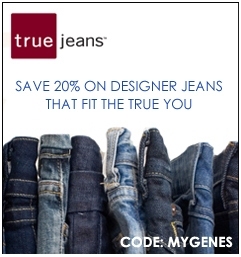 Log onto EmbraceYourGenes.org to take advantage of the special promotion from True Jeans which benefits NEDA and education on eating disorders. Go to MyNeda.org for details on a NEDAwareness Week event near you. Great post, wish there were more stores around my parts with decent skinny jeans, but at least I have the internet.